We loved our brunch at The Leopard at des Artistes where food, setting and ambiance combine for a memorable meal. The magic of having brunch at The Leopard at des Artistes begins at the door on West 67th Street, just a few steps away from Central Park West. Although it has its own entrance, the restaurant is housed in a landmark building with a Gothic façade called the Hotel des Artistes. According to the realty site StreetEasy.com, the list of notables who lived here since it opened in 1917 has included Noel Coward, Isadora Duncan, Fannie Hurst, Mayor John V. Lindsay and Norman Rockwell. But at the time it was built, the entire block on West 67th Street was filled with studios of artists and musicians; the restaurant opened because the studios in the Hotel des Artistes (which was an artists’ cooperative) had no kitchens. The inside of the restaurant is captivating and also filled with history. The large murals in the bi-level dining room (some on wood panels and some painted directly on the walls) depict nymphs that were painted by Howard Chandler Christy between 1920 and 1935, when the artist was a resident of the building. Even though we have lived in the suburbs of New York for many years, there are always older restaurant gems we haven’t tried or new ones we’ve yet to discover. When NYC Restaurant Week comes around twice each year we take advantage of the opportunity to try one or more of the ones on the list at a discount. We found out about The Leopard at des Artistes by glancing at the list of participating restaurants and were lucky enough to snag a reservation by phone only the day before for the three-course fixed-price Sunday brunch. There were several options for each course. 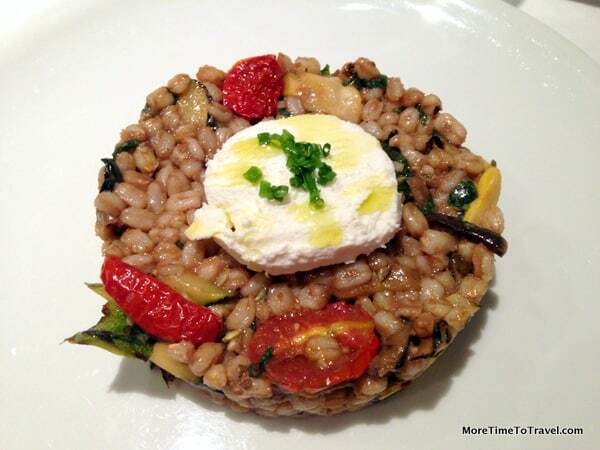 For my first, I chose the farro with grilled summer vegetables and goat cheese, garnished with oven-dried cherry tomatoes. A great choice! My husband and son chose the soup of the day, asparagus puree soup with cheese croutons parmigiana. For the second course, Jerry had poached eggs all’Amatriciana in tomato and guanciale sauce served in a cast-iron pan. For the main course, Andrew and I each ordered the exquisite homemade spaghetti chitarra alla Sorrentina served al dente with fresh tomato and buffalo mozzarella. For desserts we shared a trio of homemade gelato and sorbet that was also outstanding. The setting was lovely with sun streaming through the ground-level windows covered with decorative wrought iron and some greenery. The tables were nicely spaced. Our dishes were perfectly cooked and seasoned, and portions were right-sized. The efficient wait staff, professional but friendly, added to our enjoyment of the meal. At $25 per person, our three-course fixed price NYC Restaurant Week brunch at The Leopard at des Artistes was a bargain. We asked to see the regular dinner menu: a bit more pricey. But we were so wowed by the food, ambiance and service that we know we’ll return. 1 West 67th Street, New York 10023; check the website for opening hours. The same owners have a sister restaurant, Il Gattopardo (The Leopard) on West 54th Street that we also hope to try. NYC Summer Restaurant Week runs from July 21-August 15, 2014. Do you have a restaurant week in your city or in a city nearby? Have you seen Chef, the movie? Everything looks delicious. Can we have brunch here when we meet up in NYC someday?? I’m going with Jerry’s choice of Poached eggs all’Amatriciana in tomato and guanciale sauce. You have a deal, Cathy!